This is a great drill for players to practice shooting with perfect form and also a for coaches to teach and correct shooting form. Players form three lines a couple of feet out from the basket. Use both ends of the court if possible so that kids get to take more shots. Every players has a basketball. Players then take it in turns shooting with the aim to swish each shot through the net. The swish is important because we’re trying to teach the kids how to shoot with enough arc on the shot. After a player has taken a shot, they can either return to the end of the same line or rotate lines either clockwise or anticlockwise. Players must hold their shooting form until the shot has been made or missed. Coaches must view each players’ shot at different angles. Different angles will show different technique points. You can extend the distance of the shot, but make sure it’s not too far. 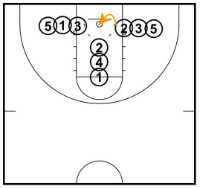 The purpose of this drill is shooting with perfect form around the basket.